Friday 15th February 2019. 10 am-12 pm. 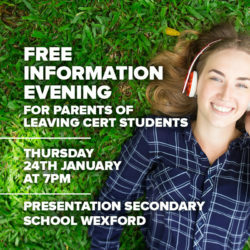 Please contact Teresa Bradshaw at the school to confirm attendance at tbradshaw@preswex.ie or call the school on 053 912 4133. Terri is a qualified therapeutic counsellor for adolescents, with over 15 years experience of working with children and young people with a range of social, emotional and mental health issues. Her background includes working in educational settings and her private practice. She has worked with families and young people with Special Educational Needs and Learning Disabilities including Autism, ADHD and Asperger’s Syndrome. She recently gained her Masters Degree in Special and Additional Learning Needs, and delivers specialist support to schools and families. Terri currently runs the parenting programme 1-2-3 Magic to parents. For young people she runs Social Skills groups, providing children with the essential strategies that include friendship skills, managing anger, and communication skills. In addition to this, she also delivers The Why Try Intervention, designed for young people with challenging behavior and additional needs who are at risk of school exclusion. 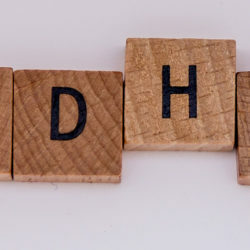 She formed the ADHD support group in Wexford in 2018, which she co- facilitates in association with HADD Ireland. © 2019. Presentation Secondary School. All Rights Reserved.